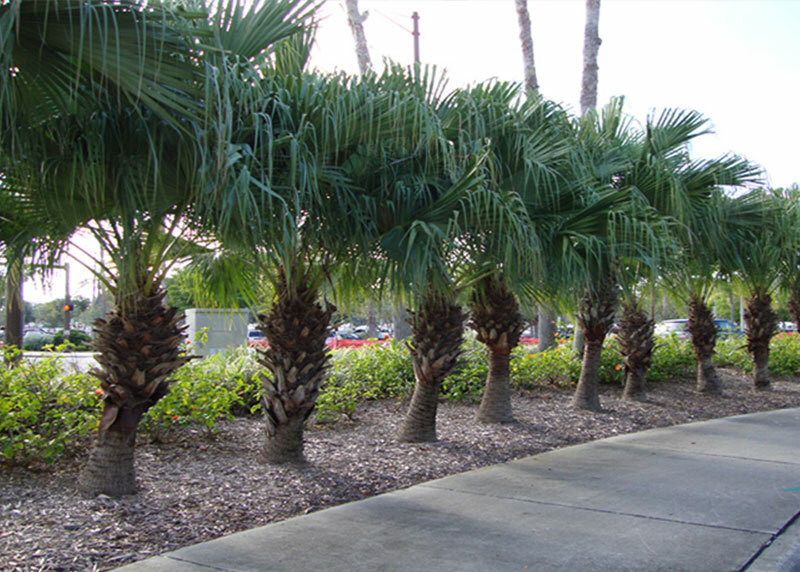 The Chinese Fan Palm, also called the Fountain Palm, is a landscape and garden favorite due to its versatility and ease to grow. This is one of the palm trees that's perfect for a beginning gardener. It is commonly cultivated as a house plant when they are young, despite the fact they will grow to 50 feet tall in nature. A native to Taiwan, the islands of Southern Japan and southern China, it has made its way around the world to many different countries. This palm is a great addition to any landscape no matter what size it is. The Chinese fan palm has near circular fan leaves which are partly segmented. This gives the large leaves an attractive droopy sort of appearance once older. The leaves on the younger trees are a brighter emerald type of green, with a brown / red trunk. Their leaf stems do have spines on them when they are young to help protect them from predators. At this stage their leaves appear more flat and don’t droop. Once they are larger and more mature the spines disappear. Once at this stage their leaves are a more olive type of green getting up to 6 feet across and their trunks display a more gray color. They will get arching large, long sprays of whitish yellow flowers- up to 6 feet on older trees. The blossoms will turn to a fruit that will be an almost deep, bluish, turquoise in color once ripe. The display of flowers or fruit just adds extra to its beauty. Growing in part shade to full sun and in just about any soil conditions, as long as it drains well, it can live as a container specimen for many years. It will prefer part shade in the extreme heat. This tree has become so adaptable outside its natural habitat that in some of the warmer wetter climates like Florida or parts of the Caribbean that it is considered an invasive species.